The description tag on the chair reads, "This is one of a pair. Painted wood with gesso and silver leaf. Italian, possibly Venice, ca. 1756. 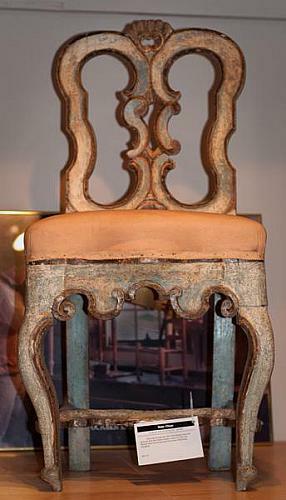 The Baroque chairs have an open shell form crown. Paint losses throughout." The side chair is part of the Baker Furniture Study Collection at Kendall College of Art and Design.